I am a baby-wearer to the MAX. I studied cross cultural parenting in college which gave me a whole new outlook on baby wearing. Not only is it convenient but it has AMAZING benefits. 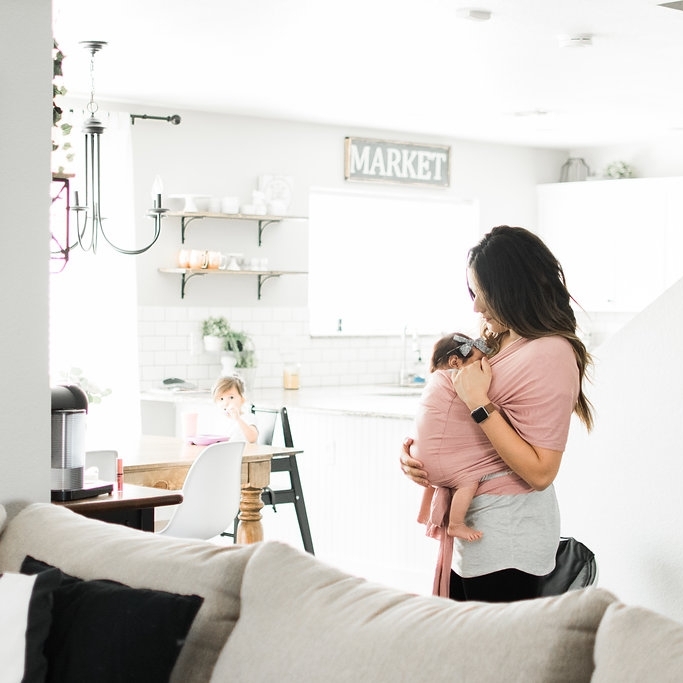 Personally, I practice Attachment Parenting and something called "The Second Nine Months" , and it has honestly been incredible with all 4 babies. I have 4 very secure babies, who sleep great and are very confident. Confident enough to play on their own without hanging all over me. Which is why I can survive with 4 kids! But there are SO many different types of carriers on the market. How do you know which ones to pick? I am sharing 3 different types of LilleBaby carriers and why I love each one. If you have any questions leave a comment or shoot me an email! I would love to hear from you! This carrier is one of my favorites for the newborn stage and to use around the house. This particular carrier pictured is the "Tie The Knot Wrap" by LilleBaby. This wrap has some very cool features including bands at the ends or the "tails" of the wrap to tie the long pieces up as you put the wrap on. Hence the name. This carrier is secure, keeps the baby in place, and you can move around easily while wearing the baby. Its also great for the newborn stage because the baby can feel your body temperature so it regulates the baby's temperature, the baby can hear your heartbeat, and you feel secure knowing your baby is close to you. Its always a bizarre feeling once the baby is out and not attached to me anymore. So I love this carrier to help both mom and baby. Here is a great video on how to put the carrier on and wear the baby. This carrier is SO easy and quick to put on. This one is also from LilleBaby and its the Ring Sling in Magic. This is the carrier I keep with me when we run quick errands. I personally love this carrier for 2 months - 12 months. I like how you can wear the baby on the front when they are little and as they get older you can switch them to the hip. Check out this video to see how this wrap works. This is the LilleBaby 6-in-1 Complete Embossed Luxe Carrier in Noir. This carrier is SO comfortable with added back support and so many different ways to wear the baby. There are a ton of videos at the bottom of the page that I linked to the carrier. It shows you the 6 ways to wear the baby. You can use this carrier at basically any age, but I love this for when they are 6 months to 2/3 years old. When they are little, you can wear them on the front and as they get older, you can throw them on your back while you are out doing things, running errands or cleaning the house. This one is also very quick to put on and feels super secure!